In this project I burned a vintage Apple monochrome monitor, forever separating it from the CPU and electrical grid... it is now retired from duty and will never require them again. Its hardware functions are now vestigial, but as a software art object it has attained archival nirvana. I wrote a software program in Apple II Integer Basic that displays an image on the monitor's screen. Then I ran the program continuously for about 9 months. The software image was eventually burned into the screen because the internal phosphor compounds which emit light lost their luminosity and left behind a ghostly trace. While many have had this happen to their monitors by accident (which is why screen-saver software was first invented) this is the only case I know of where the burning action was purposeful. 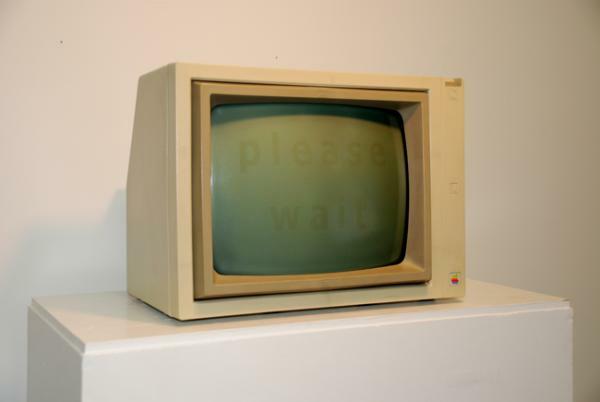 The "please wait" text is actually a raster image which took a healthy amount of software code to create. The old Apple II operating systems (DOS 3.x, ProDOS, etc) did not come with any fonts you had to code them from scratch.